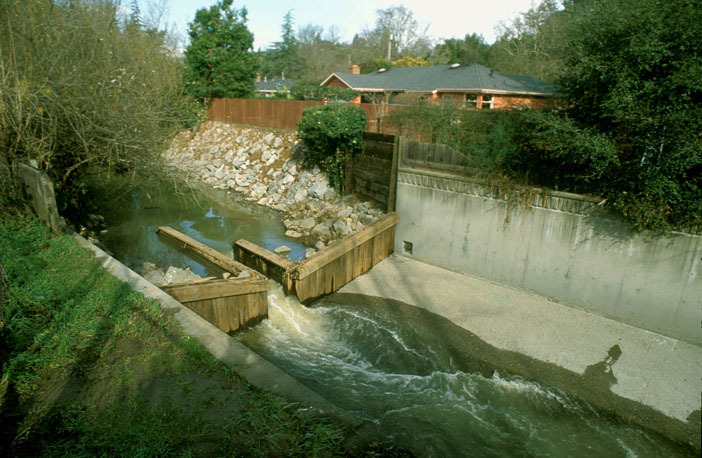 For salmon and steelhead, the tragedy in Ross began in 1969-70, when Corte Madera Creek was encased in a concrete flood-control channel and a three-foot wooden wall was constructed across the upstream end, effectively blocking virtually all upstream migration of coho salmon and steelhead. A half-century later we have an opportunity to fix this problem by removing the wall and 900 linear feet of concrete channel. However, old habits die hard and trusting the US Army Corps of Engineers to finish what they started is hard for residents, and for the old-timers who witnessed this wholesale destruction of creek habitat. The story of the Corps of Engineers project in this watershed goes all the way back to the 1940s, when frequent flooding prompted studies which ultimately led to the construction of Units 1, 2, and 3 in Larkspur, Kentfield and Ross in the late 1960s. The entire six-unit project was originally planned to extend upstream to Fairfax, but due to public opposition it was halted in Ross. If Friends of Corte Madera Creek Watershed had existed back then, we would certainly have been fighting the Corps and its local partner, the Marin County Flood Control and Water Conservation District, over this project. This project was built shortly before the modern environmental movement and important federal legislation such as the Clean Water Act (1972) and Endangered Species Act (1973). 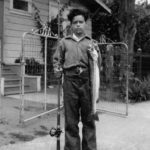 Coho salmon and steelhead used to migrate upstream to spawn during the winter months in such numbers that fishing shacks were built up near San Domenico, and photos from the 1950s show kids holding big fish. In the years after the concrete channel’s construction, numbers of migrating fish have dropped off, and coho are considered extirpated from Corte Madera Creek. The reason for this is two-fold. At flows that attract spawning fish, the water velocity in the concrete channel is too fast and there are no places out of the fastmoving current where the fish can rest. In the event that they can swim up the channel, they are faced with jumping over a 3-foot wall, with no pool at the bottom to jump from. 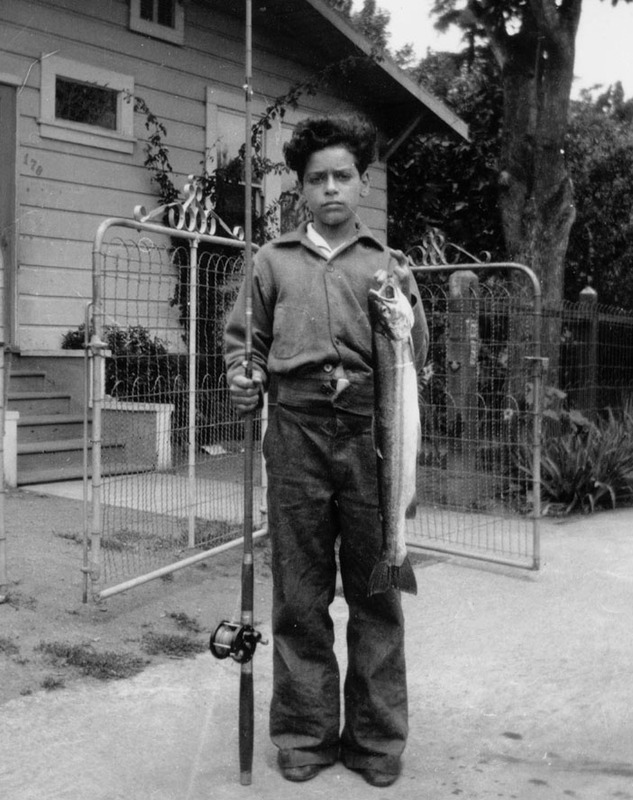 Elmo Cozza, at his home on Dominga Avenue in Fairfax in about 1938, holds a steelhead he caught in a local creek. Fish biologist Andrew Bartshire pointed out that the fish is both large and thin, and the photo was taken in summer, all suggesting that the fish had been stranded in a pool, unable to return to the ocean after spawning. Photo courtesy of Fairfax Historical Society. The transition from natural creek to concrete channel functions so poorly that the Corps and Flood District have reopened the project and proposed a suite of alternative configurations to achieve better flow conveyance through Ross. The Corte Madera Creek Flood Risk Management Project draft Environmental Impact Report/Study (EIR/EIS) was released in October and the comment period on the draft has closed. For the next nine months, the Corps and District will address comments received. At some point the County Board of Supervisors will hold another hearing and decide whether to certify the EIR and, separately, whether to move forward with construction. The alternatives presented in the draft EIR/EIS contain combinations of methods to keep water from leaving the creek including channel widening, flood walls at the top of the bank, and a bypass tunnel. The configuration with the highest ratio of flood risk reduction benefits to cost, Alternative J, includes removing the wooden wall and upper 900 feet of concrete channel, widening the creek, creating a floodplain, and restoring the waterway as a more natural creek. The upstream end of the concrete channel would be moved down to the tennis courts in Allen Park. This part of the project (Phase 1) would be constructed with the state grant originally intended for the Phoenix Lake dual-use project. Friends of Corte Madera Watershed submitted a letter in support of the project and adoption of Alternative J, the one also preferred by agencies. The fact that all these years later we are supporting the Corps project would seem to make us strange bedfellows, but at least partially addressing the fish passage barrier has been a major goal of our organization for many years. If this first step could be achieved, it would set the stage for more work downstream to benefit salmon. If salmon were able to return to Corte Madera Creek, the tragedy of Ross Common would have a happy ending years later. This entry was posted in Creek Chronicles by CharlieKennard. Bookmark the permalink. All use of text and photographs for other than personal purposes is prohibited without permission from Friends of Corte Madera Creek Watershed.